I use an electric kettle to make tea. Our kettle is an Aroma Kettle . I'm not sure of the exact model but it is similar to the one pictured on the right. I used to heat water in the microwave to make tea. At some point I switched to using a kettle instead. I can't even remember why I switched. I was curious to find out exactly how much power a kettle uses versus a microwave so I decided to test it. I boiled one cup of water with the electric kettle and I heated one cup in the microwave. I measured the electricity used in both using my kill-a-watt meter. It was a fairly simple test and the results are straight forward. I guessed that the microwave would use 0.0167 kWh. Its a 1000 Watt microwave and if I run it for 1 minute then thats 1/60 of an hour. Running a 1000 Watt device for 1/60 of an hour equates to 1/60 kWh or 0.0167. I measured it to be sure.. I hope you can see that well enough. Sorry the picture isn't that great but the lighting isn't good due to the kitchen cabinets overhanging the AC outlets. 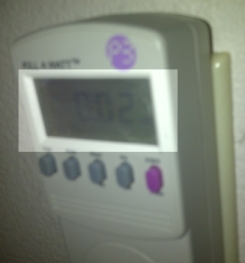 The kill-a-watt meter shows 0.02 kWh consumption. Thats close to the 0.0167 rounded up. I really had no idea how much power the kettle would use. 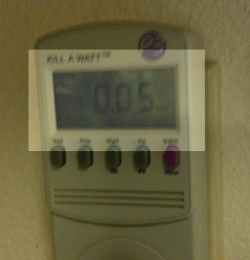 The kill-a-watt meter shows that it used 0.05 kWh. The electric kettle uses approximately 2.5 times as much electricity to heat water as does our microwave. 0.05 kWh is not a lot of electricity. If I used the kettle to make a cup of tea every day of the year then that would equate to 0.05 kWh x 365 days x 11¢ per kWh = $2.01 electricity per year for the kettle. THe microwave would use $0.80. I'm spending about $1.20 more per year using the kettle than the microwave to heat my cup of tea.